What is it about St.Agnes? The kids ask questions; we don't know the answers. Or we just get that curiosity itch. Have you ever wished that you had a local to tell you things about a place that only a local would know? 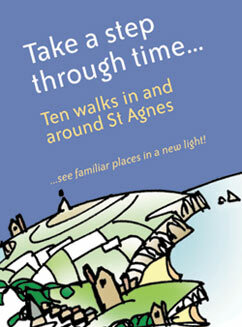 Why is that part of St Agnes called the Promised Land? How old is the Miners Arms really? How does one get to the top of the Beacon? Where did the still unsolved double murder of 1920 take place? When was the church in the village centre built? 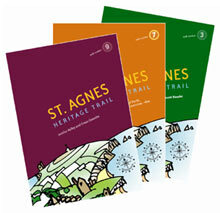 We assembled a team of locals, added a couple of prominent local historians, took advice from the St Agnes Museum, and mapped out ten walks that would take in the scenic beauty, the heritage, and local features of this fascinating place, so rich in things to see. 1955: "In the Cornish village of St Agnes, there is a small park known as 'Friendly Retreat,' a name which very aptly describes the whole village, for the friendliness of the people and its quiet beauty afford a pleasant retreat from the hurry of town life." 1977: "Justifiably has it (St Agnes) gained the name of the friendly village, for one does not need to be psychic to be conscious of the atmosphere of genuine cordiality and the sincerity of welcome given by shopkeepers and villagers alike... it is a place set apart with a special and unequalled charm and it has remained truly Cornish." 2006: "Newcomers to the parish comment on the friendliness of its people"